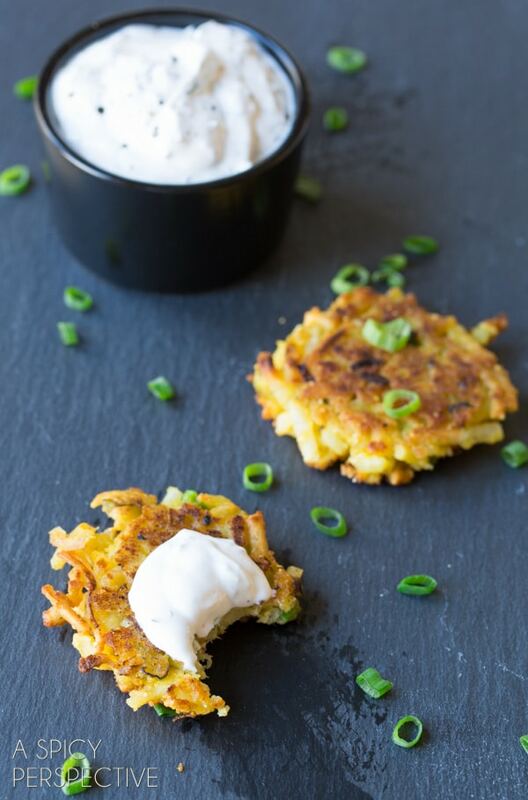 Potato Latkes with Jalapeño Dill Sauce makes a marvelous addition to any spring table! I’m a sucker for fried potatoes. Who isn’t? That being said, we don’t eat a lot of fried foods, because if they are sitting in front of me I will not stop eating them until every last crumb is gone. However, there are exceptions to every rule, and potato latkes are one of them. Especially in the spring. Potato latkes are a wonderfully versatile spring dish, bursting with textural appeal. I love making latkes this time of year, when fresh scallions, chive, and ramps are popping up. Mixing fresh onions into the latke batter makes all the difference between boring latkes and irresistible latkes. I like to add a bit of cornmeal to my potato latkes as well. 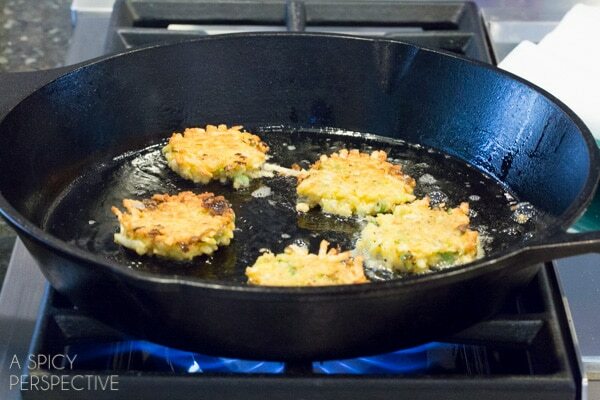 The cornmeal provides a contrasting texture inside the latkes, and makes the exterior extra crunchy! This Potato Latkes with Jalapeño Dill Sauce recipe combines crisp potato latkes with scallions, and a cool creamy dipping sauce made with fresh spring dill. A little shaved jalapeño in the dill sauce offers the perfect ammout of heat and intrigue. If you have fresh potatoes to grate, great! Use them to make these Potato Latkes with Jalapeño Dill Sauce. If not, I find using frozen hash browns (thawed, of course) works just as well. Mix the shredded potatoes with egg, cornmeal, and onions. Then scoop little balls of potato batter into hot oil. Flatten them with a spatula and fry until golden on both sides. 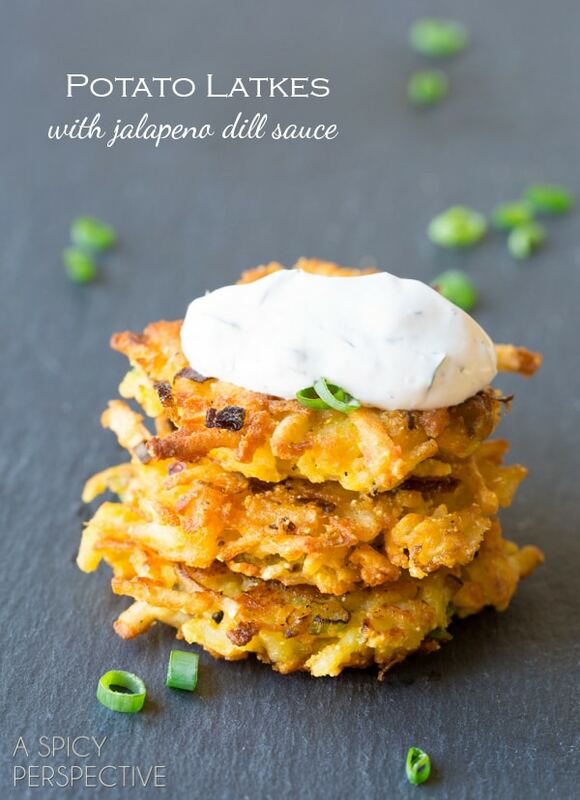 These Potato Latkes with Jalapeño Dill Sauce are so addictive. They’ll make a wonderful addition to your weekend breakfast, a spring picnic, or cocktail night! Or Easter Brunch, for that matter. 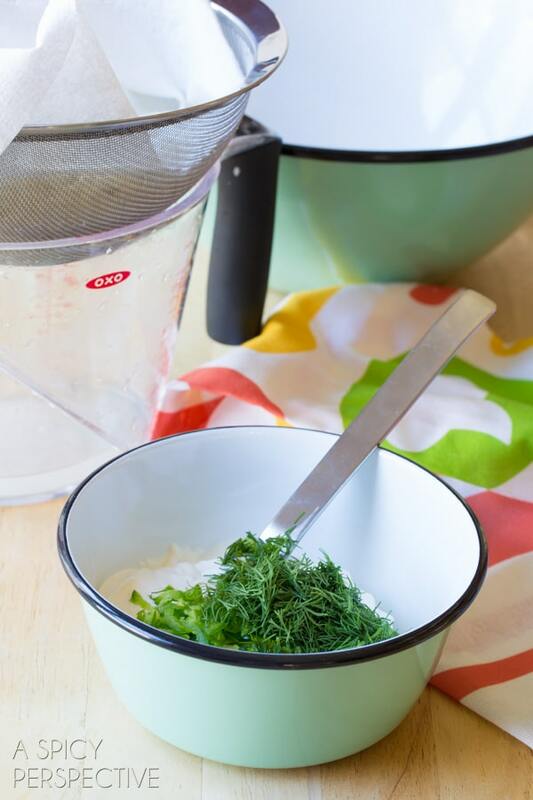 Crispy Potato Latkes with Jalapeño Dill Sauce Recipe – A winning party snack for any occasion. Making potato latkes is easy with 3 easy steps! Place a large skillet over medium heat and preheat the oven (or warming drawer) to 200 degrees F. After measuring the potatoes, place them in a sieve over a bowl and press down with paper towels to extract as much of the moisture as possible. Then mix all the latke ingredients thoroughly, in a large bowl. Set aside. In a small bowl mix the ingredients for the dill sauce. Salt and pepper to taste and put in the fridge until ready to serve. Add enough oil to coat the bottom of the skillet and place it over medium-high heat. Once the oil is hot, use a 2 tablespoon scoop to scoop the mixture into the skillet. Add 4-6 at a time, depending on the size of your skillet. Use the back of a spatula to flatten each mound into a 2 inch circle. Fry for approximately 2 minutes, then flip and fry another 2 minutes, until both sides are golden and crispy. Place the crispy potato latkes on a plate lined with a paper towel and place in the oven to keep warm. Repeat with remaining mixture and oil. Once all the potato latkes are cooked, serve warm with the jalapeño dill sauce. First time I have made AND tasted a latke. This was sooooooooo yummy and easy! I had stone ground grits, so added those. Nice and crunchy. Only problem is that I have to wait 2 hours for my husband to come home and try them. I want to eat them all! The sauce is very nice. Not that spicy, so could add more jalepeno. I have an onion allergy, so added cheese instead. Scrumptious! Oh my, oh my!! These are so tasty. Super scrumptious!!! And they were really easy. The whole family really enjoyed them. 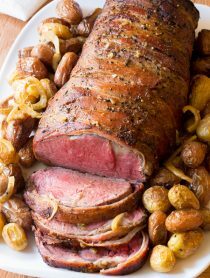 Thank you for this wonderful recipe… it is going into regular rotation on our menus. Hi, I am in the UK and would like to know what your cornmeal looks like, colour and texture, or can you give me the brand so I can make sure I use the right stuff, as we sometimes have the same name for completely different things! Hi Ann, It’s just dried coarsely ground corn – white or yellow. It might be considered corn flour where you live, but it’s usually not as fine as corn flour here. It’s also not as coarse as polenta or grits. The recipe sounds good. I see that you mentioned it would be great to have at an Easter lunch. Since you mention a religious holiday in your post, I would also like to point out that in traditional Jewish culture, the potato pancake a.k.a potato latke is served during the Hanukkah holiday which pops up between thanksgiving and new years. Also, in spring the Jewish holiday of Passover is celebrated, which involves a fast from risen breads. Potato pancakes being another staple food in the celebration of this holiday. Hi, can you please tell me a substitute for the eggs. Thanks! 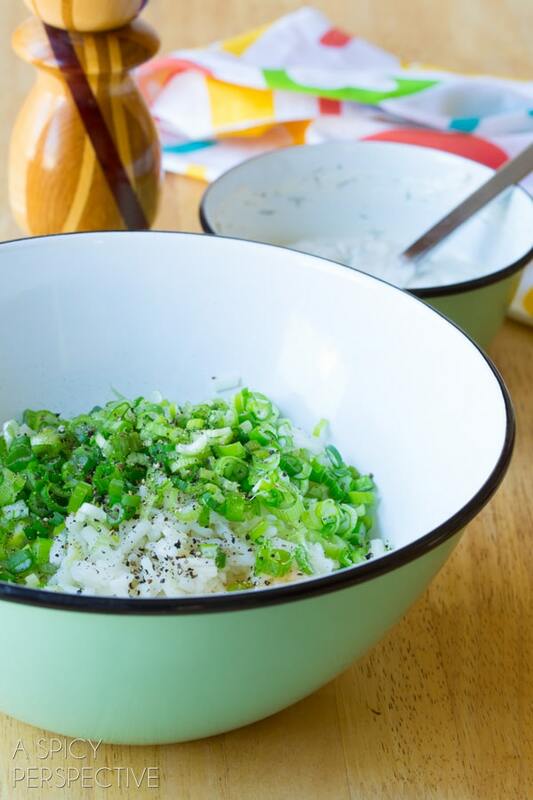 I am late to this jalapeno-dill sauce love fest but YES! 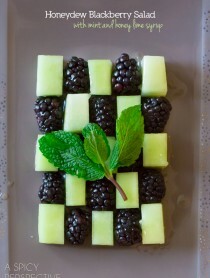 these look absolutely scrumptious – pinning! My youngest has been obsessed with The Latke Who Couldn’t Stop Screaming for his bedtime story lately. I’m going to have to make these for him for a spring take on latkes. Yeah… I’m ok with any fried veggie fritters, but for some reason potato latkes always hit the spot. Love the spicy sauce on top! I am so intrigued and excited at the same time about the combination of dill and jalapenos! Those two bring together my Slavic roots and a life long passion for spice! 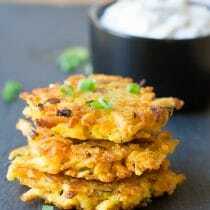 :-) I am so trying these latkes soon! These sound (and look!) so wonderful. I adore fried potatoes, especially with some dill. And with cornmeal…I must try that next time! I haven’t had latkes in so long. These look so good with sweet potatoes in them. I also love fried potatoes. I’m the same way with fried food. LOVE. Yum! Love that this is gluten free too. I make a similar version with zucchini and it’s delicious. Have you tried substituting arrowroot powder for cornstarch? It’s a great option for those allergic to corn too. I could go for a hundred million 47 right about now. These sound so amazing. Definitely Spring on a plate… any time of the day :). And the sauce is to die for!! Just perfect for spring! So delicious! Oh wow, that looks amazing! I love potatoes like this! Delicious! I kind of want to spread that sauce on top of everything. These look amazing! You said ramps, and now all I can think about is how many more weeks I have before I even have a chance of them popping up around here. Patience. Lovely latkes, too. Shaina, I can’t wait for ramps to pop up here too! I think that these look absolutely incredible Sommer! Love the jalapeño addition too! I can practically taste these! They sound so good!! 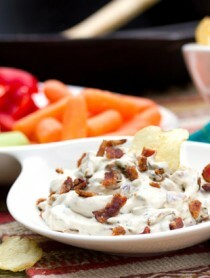 Such a creative sauce to dip these in! 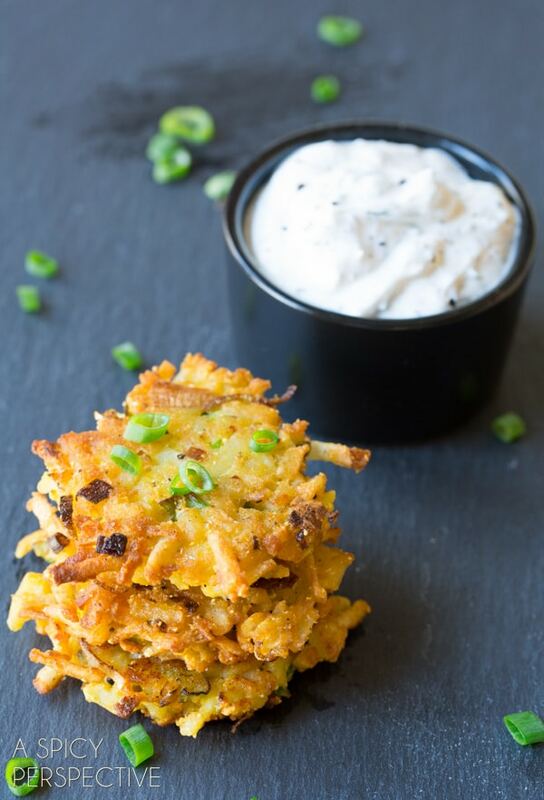 I love latkes and love that you paired it with a dill sauce! I love making latkes for breakfast once in a while, and that sauce is an amazing addition! Definitely feeding into my spicy cravings lately! Um, these are flipping amazing!!! LOVE!!! Oh these look yummy! I love the fresh herbs and of course the jalapeno, what great dipping sauce! Great any time of the day! And I love the sauce! I’m such a potato-holic – these look sooo good. I love how crispy around the edges they get! 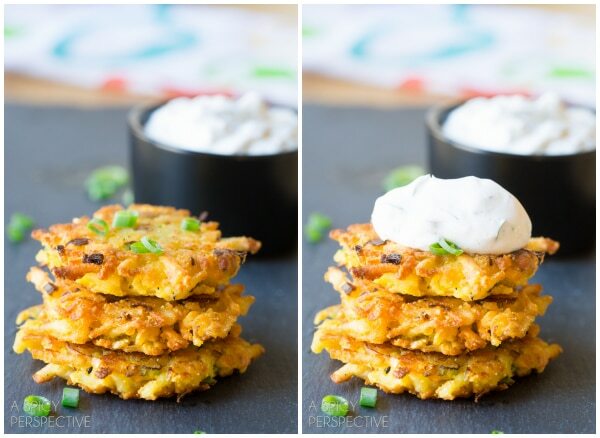 That dill sauce on top is a great addition to these latkes! Julie, I love the crispy edges too! Totally my kind of snack, Sommer. Loving that sauce! I’ve never seen potatoes so gorgeous before! Fabulous! These sound and look fabulous for Easter brunch!! I love that jalapeno sauce! These sounds so good, Sommer! I am still waiting for Spring to arrive, but I will be making these in the meantime! Thank you Tieghan! I hope Spring time arrives soon for you! One of my favorite things and the additional of jalapeno sounds divine. I can live without french fries but every now and then I really crave a potato latke (or if desperate, a fried spoonful of leftover mashed potatoes!). Denver is not in spring mode yet…but I’m ready for fresh herbs and you have made the craving that much worse. In a good way! Thank you Barbara! I guess I should not tell you that it has been in the 70s here for the pass couple of days. ;) I hope Spring arrives soon for you!